Shipyards are turning more and more often to their own design departments for solutions despite the availability of a great number of designers of international stature. 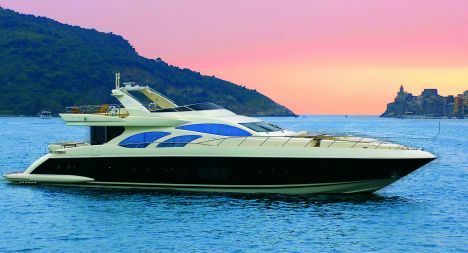 For further information: Azimut Yachts; via M. L. King 9/11; 10051 Avigliana (TO); tel. 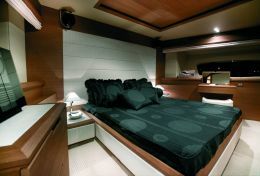 011 93161; fax 011 9367270; web page: www.azimutyachts.net. It is felt that having an internal styling department is tantamount to reducing production costs and of optimizing human resources. Among the shipyards that have their own design department, there is a renowned Italian name that of Azimut Yachts whose technical office is based at their motor yacht division on their premises in Viareggio, where Azimut builds yachts over 68'. The technical department is currently staffed by 14 members but is expected to grow to twenty in the near future. The technical office includes the styling department which is made up of three architects and an engineer. 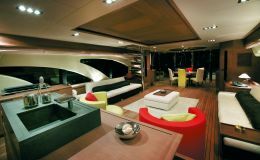 In Azimut Yachts case, the styling department is responsible for the assembly of the interiors and its furnishing in collaboration with Galeazzi's architects office who is in turn responsible for designing them on behalf of the Italian shipyard. 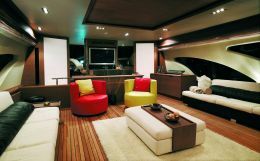 The styling department is furthermore responsible for all those parts inherent to the yachts' construction that are handed out to other companies. The technical department is instead in charge of studying the streamlines, the structures and systems on board as well as following the completion of the exteriors designed and conceived by architect Stefano Righini, author of Azimut Yachts' exterior design. The technical office became an autonomous division back in 2004 and its objective is to unequivocally highlight the characteristic features of the boats built by the yard and to support the production lines both in terms of quality and speed of reaction. 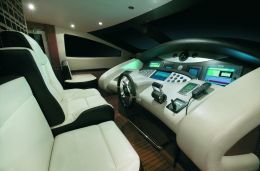 Every detail is planned by the styling department of the motor yacht division through sophisticated 3D software and by comparing data with the motor cruiser division, in Avigliana, where Azimut builds it boats under 68'. The purpose of the exercise is to share ideas and synergies. The yachts developed by the styling department in conjunction to Carlo Galeazzi's architects office, are Azimut's following models: 75,85,105 and 116'. The styling department also gave proof of its own versatility in producing its own concepts over a project presented by Carlo Galeazzi regarding the recent restyling of the interiors of the "Lenonardo" 98 model.